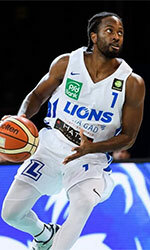 Uppsala Basket (Basketligan) added to their roster 26-year old French-Congolese forward Eric Katenda (206-109kg-92, college: N.Texas). He played last season at Lakers in Swiss SBL league, but left the team in Jan.'18. In 16 games he recorded 9.7ppg and 5.8rpg. The previous (16-17) season Katenda played at ESSM Le Portel Cote d'Opale (ProA) in league. But in 23 games he averaged just 1.1ppg. His college team won ACC Tournament in 2015. Katenda graduated from University of North Texas in 2016 and it will be his third season as a professional player.